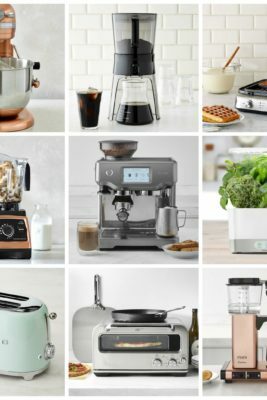 I have a two-part gift guide for you. 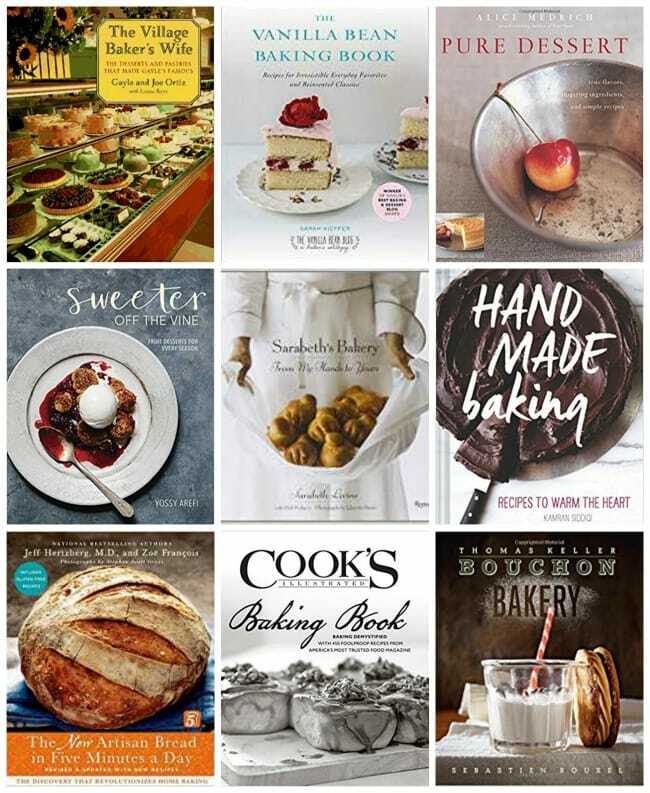 Today is favorite baking books and favorite kitchen items, next week is more cookbooks and Holiday music. So let’s get to it. First up, the baking books I use all the time in my kitchen. The Village Baker’s Wife by Joe Ortiz and Gayle Ortiz – This book is a classic, and you can only find it used, but there are so many great recipes among it’s pages. I highly recommend seeking it out. From the Library Journal: Here are recipes for the croissants and Danish pastries, pies and tarts, cookies, muffins, and other delicious delicacies sold at Gayle’s Bakery in Capitola, California. The recipes are well written and thorough, and techniques are often illustrated with whimsical but very clear line drawings. Highly recommended. The Vanilla Bean Baking Book by Sarah Kieffer – Yes, I snuck my own book in here. But, it does contain all my favorite recipes, and I use them all the time in my own kitchen. 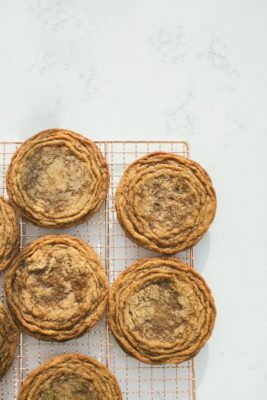 You can find my Pan-Banging Chocolate Chip Cookies in here, but my other favorites are Pumpkin Scones, Burnt Honey Buttercream, Quick Danish Dough, and Peach Caramel Pie. 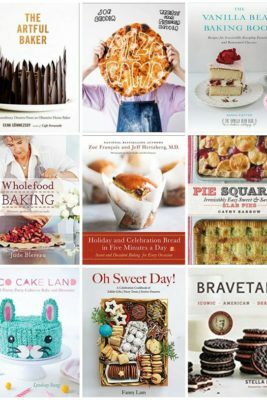 Sweeter Off the Vine by Yossy Arefi – Here are beautiful photographs, recipes that always work, and a unique perspective on baking. I absolutely love Yossy’s book, and turn to it often. 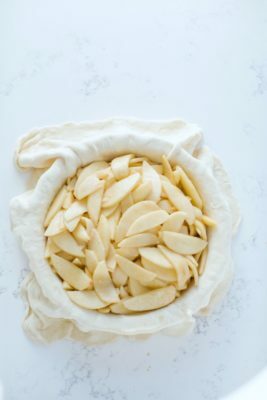 Favorite recipes: Yossy is known for her pies, so anything involving pie crust is a winner (see Cherry and Rhubarb Slab Pie, Pear Pie With Creme Fraiche and Caramel, and Tangerine Cream Pie), I also love her Old-Fashioned Blood Orange Donuts and Apricot and Berry Galette With Saffron Sugar. Sarabeth’s Bakery by Sarabeth Levine – This might just be my favorite baking book. It’s definitely the one that made me fall in love with laminated doughs. The photographs are quiet and beautiful, there are process shots to help with complicated recipes, and everything I’ve made has turned out perfectly. I’m especially smitten with the puff pastry dough as well as the danish dough. It’s a gorgeous book, and a good addition to any baker’s library. New Artisan Bread in Five Minutes a Day by Jeff Hertzberg and Zoe Francois – If you’ve been following along here for awhile, you probably already know that I contribute to Jeff and Zoe’s Bread in Five site quite frequently. I worked on this book with them as well – a week long photo shoot in Zoe’s house with lots of baking and food styling and washing dishes and laughing hysterically. It was a blast. This edition is revised and updated with new recipes. I use this book all the time, and am obsessed with the Challah dough – it’s perfect. Cook’s Illustrated Baking Book – I appreciate Cook’s Illustrated and all the rigourous testing they do to make sure a recipe is fool proof. I turn to this book often when trying something for the first time or if I’m stuck on a recipe in another book. There is good advice and helpful hints among the pages, as well as recipes for all the classics. Bouchon Bakery by Thomas Keller – I’m slowly working my way through this book. It’s gorgeous, and inspirational, and can double as a coffee table book. Mauviel 10.2-inch Round Copper Pan – This pan by Mauviel is gorgeous, and I use it for everything – baking, cooking, serving. I’ve made buns, cinnamon rolls, gratins, crisps, and all kinds of other goodness in it. 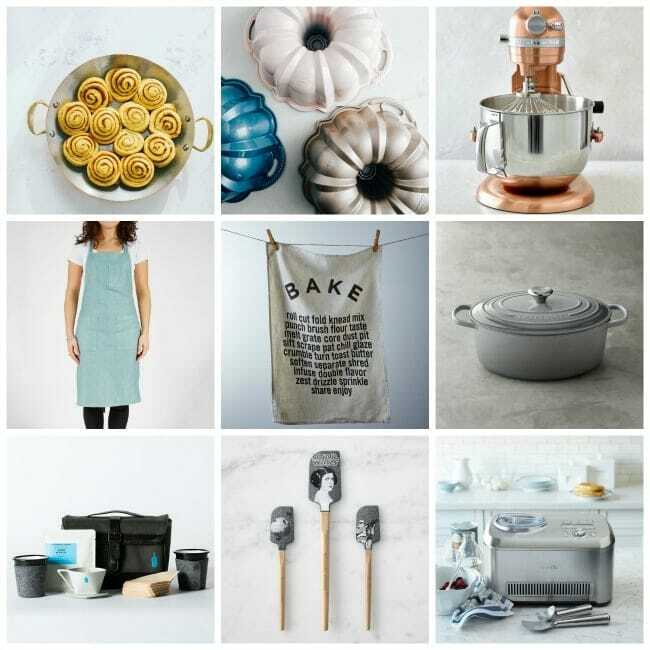 Nordic Ware for Amazon Kitchen – I’ve been using Nordic Ware Bundt pans for years and years (and love that they are a Minnesota-based company!). They just came out with these pretty colored Bundts – blush pink, champagne, and metallic blue. I have two pans in this series and my pound cakes have turned out perfectly every time I use them. Kitchen Aid Pro Line Copper Mixer – This is the Queen of mixers. I recently upgraded to this beauty, and have found it to be worth the extra price. It is much quieter than the 5-quart (which I had previously), the the 7-quart bowl fits everything nicely. Also, the copper finish looks amazing in any kitchen space. Linen apron from Enrich & Endure – Aprons handmade in Northern Ireland, made with quality materials, longevity, local craftsmanship and top-class design. The colors are gorgeous and vibrant (I have one in lava). Bake Tea Towel – I love tea towels, and baking, so this is a perfect addition to my kitchen. Le Creuset Oval Dutch Oven – A good Dutch oven is a great tool to have in the kitchen; I use mine several times a week. If you haven’t invested in one yet, I highly recommend doing so. The Weekender from Blue Bottle Coffee – This is the perfect gift for any coffee lover – neatly packed in this custom Timbuk2 bag is everything you need to make delicious coffee during any weekend getaway. Star Wars spatulas – I have a lot of spatulas from Williams-Sonoma, and use them on a daily basis. This Star Wars edition with Princess Leia is on my wish list – I’ve got a family full of Star Wars fans who are all eagerly awaiting episode 8 . Breville Ice Cream Maker – An ice cream maker may not be a necessity, but it sure is a nice piece of equipment to own. This fancy machine is a welcome addition to my kitchen – it produces velvety frozen treats with no prefrozen bowls required. If you love making your own ice cream, this is for you. (Pair it with David Lebovitz’s The Perfect Scoop or Hello, My Name Is Ice Cream by Dana Cree).